District fourth grade students are treated to an introduction to orchestra instruments led by high schoolers on the AHS stage. The Foundation funds bus transportation for fourth graders to the high school. Founded in 1987, the ASEF has rich history of giving where the need is greatest in the Adrian Public Schools. In its beginnings, the Foundation offered attendance incentives for teachers and then began its classroom grant program. It has raised funds to replenish library books, purchase supplies and materials for the visual arts, send students on field trips and provide students with music and performance experiences they may not otherwise have. Classroom grants have provided teachers with technology hardware and software, manipulatives, books and workbooks, and science, language arts, mathematics and history curriculum kits. Grants for musical instruments, music software, visual arts supplies and materials as well as museum and performance field trips have also given students hands on learning opportunities. 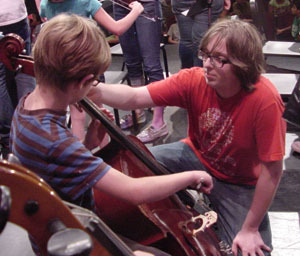 While the Foundation's focus today remains on providing learning opportunities for students, the fund raising efforts are three fold: an Arts Endowment has been established to assure the fine arts remain a vibrant piece of the curriculum at APS; an Academic Endowment has been established to assure cutting edge opportunities for students; and emphasis has been placed on purchasing classroom hand-held technology. The Foundation continues its signature Classroom Grant Program.